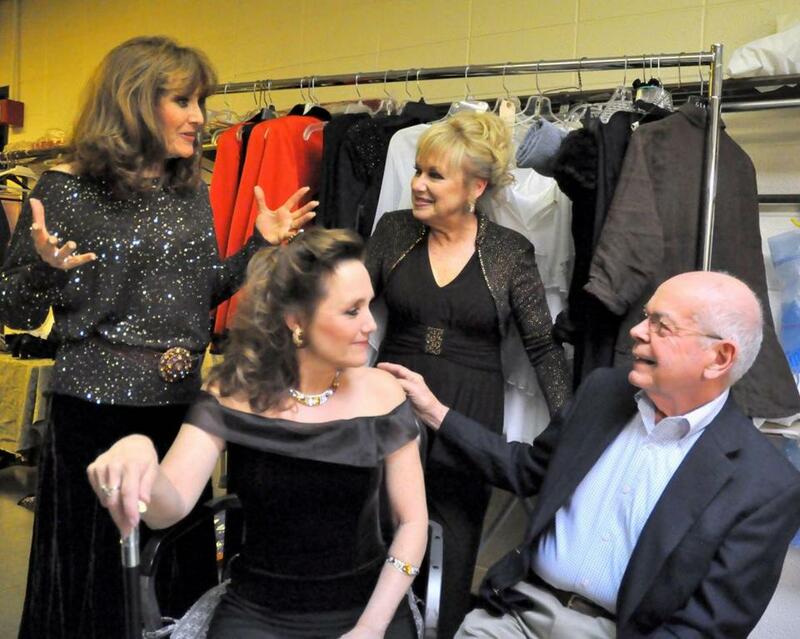 The Lennon Sisters backstage with Reagle Music Theatre founder and executive producer Robert J. Eagle before a Mother’s Day concert last month. Now known as the Reagle Music Theatre of Greater Boston, the company will kick off this summer on June 12 with another Rodgers & Hammerstein classic, “South Pacific,’’ slated to run through June 22. Next up will be “Me and My Girl’’ (July 10-20), followed by “Singin’ in the Rain’’ (Aug. 7-17). All three productions will feature full orchestras, something Eagle has prided himself on from the beginning. “It’s been difficult, but it’s been critical,’’ he says. In its early years, the Reagle offered a mix of musicals and straight plays, but then settled into its identity as a reliable purveyor of theatrical comfort food in the form of solid productions of brand-name musicals. A typical Reagle cast is 90 percent amateurs and 10 percent professional actors, according to Eagle. But some big names have performed at the 1,082-seat Robinson Theatre over the years, either in musicals or in concerts, including the likes of Patti LuPone, Debbie Reynolds, Shirley Jones, Rachel York, Mitzi Gaynor, Robert Goulet, and Tommy Tune. Q. When you founded Reagle Players as a summer theater all those years ago, did you envision it having this kind of staying power? Q. Had you seen a lot of theater growing up in Waltham? A. My first big show was “Oklahoma!,’’ at the old Opera House. This was when it was beginning its national tour. I was smitten. I couldn’t believe this whole thing. Even before that there were church shows and community theater. The curtain opened and I was hooked. Q. What was the state of musical theater in the Boston area back then? A. All of the shows headed to Broadway tried out then. At the Shubert, the Colonial, it was just one after another, pre-Broadway, working on the show, trying to fix it and send it off to Broadway. I walked right down the street behind Irving Berlin and Ethel Merman when they were doing “Call Me Madam.’’ It was just so thrilling to be there during a pre-Broadway run. Q. Of the 300 shows you’ve produced or directed at Reagle, do you have a favorite or favorites? A. Oh, boy. Well, I loved “Show Boat.’’ It’s such a fabulous work of art. It was so ahead of its time in the themes that were explored. I think we’ve done it three times. Twice, anyway. The second time we did it was following the Harold Prince production. We lucked out because many of our performers had been in one of his companies all over the nation. They were superb singers. That production was probably a favorite of all time. Q. What qualities in a musical make you think: That’s a Reagle show, that could work on our stage? A. I guess I have to like it, for starters. We try to balance the season, to make sure there’s an opportunity for a lot of good dancers and good singers. So if one show seems to require a lot in the singing department, you might look for another that has a lot of dancing. It’s difficult to get male dancers, good ones. Q. What factors went into programming this season? A. “South Pacific,’’ I think it’s one of the best scores of Rodgers & Hammerstein. It deals with wonderful themes that maybe seem a little bit dated now, but it was almost revolutionary then. “Me and My Girl,’’ it’s just delightful: I think of it as “Downton Abbey’’ with song and dance. The upstairs-downstairs, the nobility and the servants, and the Cockney discovers that he’s a lord by birth. “Singin’ in the Rain,’’ it’s just the sort of show that people love. It’s very much like the film. Q. How would you describe your audience? A. Generally our audience tend to be seniors who don’t want to go to Boston or can’t get to Boston, or parking is an issue. Our parking is free. We’re centrally located as far as the Mass. Pike and Route 128; we get people from New Hampshire, Connecticut, Rhode Island. Q. What have been some of your more popular shows? A. “Hello, Dolly’’ was definitely up there. We made it work. A great favorite was “1776,’’ which we did in 1973. We had visions of making it like the Broadway set, so it was on three different levels. For the more intimate scenes, there were two giant moving walls that came in. I just held my breath at every performance that one of them didn’t go into the pit. A. We did very poorly with “Grease.’’ Very bad. I don’t know what it was. “Grease’’ definitely bombed. Q. Despite the challenges, I don’t get the sense that you’re interested in retiring any time soon. A. I’m not, at all. But I’ve tried to get a successor. Our board is interested in that. It’s in the works. But I’d work along with whoever that is. I’ll go on as long as I can. Interview was condensed and edited. Don Aucoin can be reached at aucoin@globe.com.